This magnificent safari with Drones Africa Safaris will take you to the finest locations in Kenya and Tanzania. See Africa's famous wildlife when you visit several national parks including Maasai Mara, Lake Nakuru, Amboseli, Lake Manyara, Serengeti, and Ngorongoro. Your licensed and friendly guide will accompany you in the game drives to help you identify wildlife and to give you details about their daily activities. Pack your bags and get ready to join this thrilling safari holiday! During the safari, you will stay at various accommodations (mostly budget camping). You will be picked up from your hotel at 07:00-08:00 depending on the location of the hotel. Join the orientation and depart for the Masai Mara Game Reserve via the viewpoint of the Great Rift Valley and Narok town for lunch. On arrival, proceed for a game drive, tracking various animal species and birds with your driver / guide. Enjoy dinner and stay overnight at the camp fixed with bed and beddings. After breakfast, proceed on a full day of game viewing within the reserve. The landscape here is scenic savannah grassland on rolling hills. 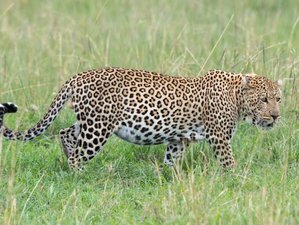 The reserve is the best park for game in Kenya as it has an extensive road and track network which allows for close range viewing and photography. Break for your picnic lunch at the hippo pool, looking out for hippos and crocodiles. There is an optional visit to a Masai village at an extra cost. Have dinner and stay overnight at the camp fixed with bed and beddings. After breakfast, depart the Mara Region for Lake Nakuru National Park. Have lunch en route with scenic views of Mount Longonot and Lake Naivasha from afar on the main highway. Enjoy your dinner and stay overnight the budget hotel with self-contain rooms. After breakfast, proceeds on a game drive in Lake Nakuru National Park which is known for its prolific bird-life including flamingos. The park contains a sanctuary for the conservation of the white rhinos while species like Cape buffalos and waterbucks can be seen near the shoreline. Drive to Amboseli National Park. Have dinner and stay overnight at the camp with bed and beddings. Experience a day of game drives in this park which contains swamp grounds in which elephants and hippos bathe in abundance. A variety of plains game, antelopes, and birds can also be seen and Mount Kilimanjaro’s peak too if weather conditions permit. You will cater for picnic lunches and return to stay overnight at the camp with bed and beddings. After breakfast, proceed to Arusha and if weather permits, you will see the view of Mount Kilimanjaro. Depart Amboseli to Arusha through Namanga border for immigration formalities and board a shuttle bus to Arusha arriving in the afternoon. Drones Africa Safaris' manager will pick you up from the bus stop and drop you at the hotel booked with bed and breakfast basis. Dinner is on your own. After breakfast, you will be picked up from the hotel and depart to Lake Manyara with lunch en route. Enjoy a game drive in Lake Manyara National Park which is famous for its tree climbing lions and large flocks of flamingos. Have dinner and stay overnight at the campsite. After breakfast, descend 2,000 feet (670 meters) into the crater floor with your picnic lunch. The full day is spent in the park with a lunch break at Ngoitoktok springs picnic site. The main crater is 165 kilometers and contains populations of varied species such as black-manned lions, rhinos, buffalos, elephants, and other grazing animals. Enjoy dinner and stay overnight at the campsite. After breakfast and your final game drive, depart to Serengeti via Olduvai Gorge. Have lunch at Gorge Museum and visit various sites of the gorge to see where the remains of the prehistoric man were discovered by the famous archeologist Dr. L.S.B Leakey. Proceed with an afternoon game drive. Enjoy your dinner and stay overnight at the campsite with bed and beddings. After breakfast, proceed in the park for your final game drive, leaving Serengeti National Park. This park has a lot of animals like lions, zebras, elephants, and other different animals that will be spotted in this park. Later, depart for Arusha with lunch en route arriving early evening for your overnight stay at a budget hotel. Dinner is on your own. After breakfast, you will be picked up from the hotel and dropped at the airport to connect a flight to Zanzibar for a beach safari or you will be dropped at a shuttle bus to come back to Nairobi. A Kenya-born adventure guide, Joseph is a great guide who does his job with passion. He is always ready to make his services available with a clean and open heart to all clients. He has a great deal of knowledge of cultural activities, animals, birds, and the Kenyan topography. His office workers are proud of him as per the services he offers to clients and the great role he plays in the organization. The company chose him from his work with many tour operators and because of his good records. The people at the agency trust him with clients, as they are aware of his clients’ satisfaction. Drones Africa Safaris' guides are committed to giving you the best of the safari experiences across Kenya, Tanzania, and Uganda. They have day trips and long trips, from game parks and reserves to cross-country safari trips. This safari will cover six national parks in Kenya and Tanzania. The parks include Masai Mara, Lake Nakuru, and Amboseli in Kenya and Lake Manyara, Ngorongoro, and Serengeti in Tanzania. All meals are served in buffet-style service. If you have any special diet please do inform Drones Africa Safaris and will do their best to accommodate your needs.